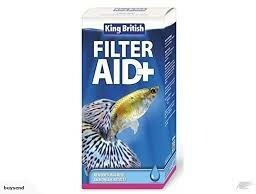 KING BRITISH SAFE WATER FILTER AID Aquarium Water Treatment. Removes harmful ammonia and nitrite Degrades ammonia and nitrates that are harmful to fish. Boosts the processing power of biological filters. Suitable for tropical and coldwater fish.